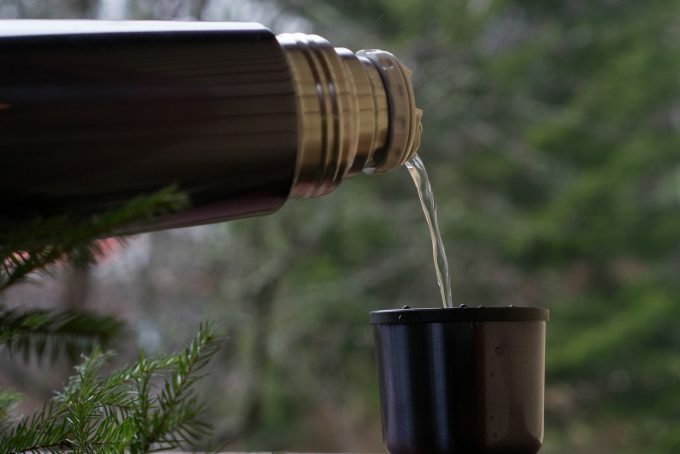 When you’re heading out on a hike for the day or even a longer trip, you always want to make sure you have something to drink with you. Even more, you want to make sure you have something that stays at the temperature you want it to be. That means you can’t take just any old water bottle. 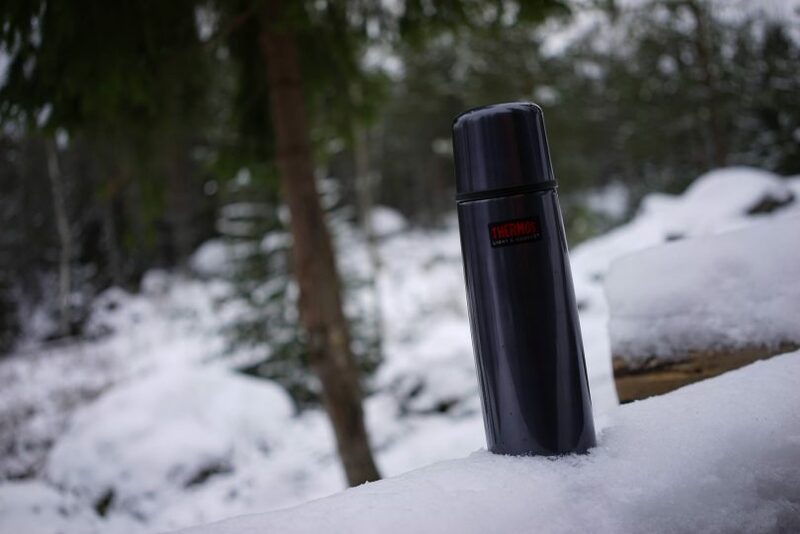 You need a quality thermos that will keep the cold (or the heat) in. That’s where the best camping thermos can be your absolute best friend. Of course, that’s only if you already know which one is the best thermos. If not, here is a helping hand. 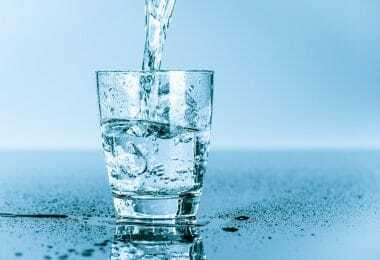 Don’t pour the drinks yet, before taking that nice thermos out from the store and show him the wildlife, let’s dwell in the list of things you have to consider before reaching your pocket to pick out your wallet. The size of your thermos may be one of the most important factors because it’s going to determine how much you can carry in it. Now, for most people, the size of the thermos isn’t going to be enough for the entire trip, but it should be large enough so you don’t immediately have to stop for a refill. You want something that will get you at least part of the way or through one day (though that may be asking a bit much as well). What may sound completely opposite of what we’ve just said here is that you want your thermos to be easy to carry as well. If you have a free pocket on the side of your bag, you will be able to put it there. On the other hand, you may have to carry it in your hand, and that could get tiring if you have an oversized thermos. Make sure you get something you can easily carry, whether it’s by hand or in the bag. This is the part that has most importance, at least for the most of the people. A good quality thermos should take care of that. 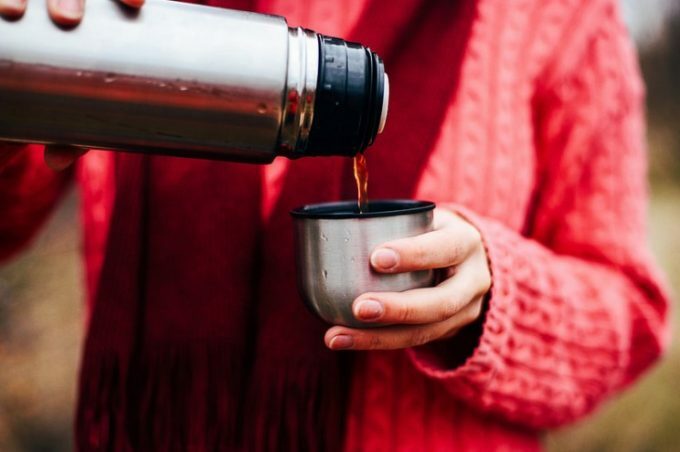 There is no hard and fast rule about how long a thermos should keep your drink at the right temperature, but you should get at least a couple hours out of a good thermos. Some of the best thermoses will keep your drink hot for over 12 hours and cold for over 24. You’ll likely spend a little extra for these thermoses, however, so keep that in mind when you’re looking for what you want to take with you. 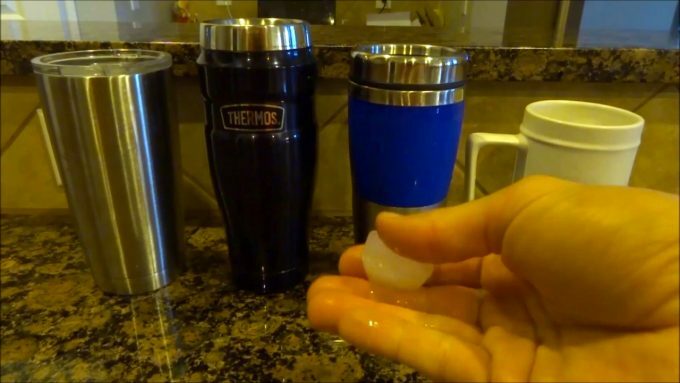 Contrary to some popular beliefs, not every thermos is capable of holding ice. Just because it promises to keep your drink cold for at least 24 hours doesn’t mean anything about being able to hold your ice cubes in it. This can be a good thing because it means the bottle itself keeps your drink cold, not any cooling aid you put in it. On the other hand, it can also be a drawback, because it may mean ice doesn’t fit. Not every thermos has a large enough opening to allow ice to easily be added. In some instances, you may be able to make smaller ice cubes to get them into the opening, but in others, you will not be able to get ice in no matter what you do. If having ice is important to you, make sure you look for a thermos with a larger opening to accommodate the ice being added through the top. That’s how you’ll keep your drinks even colder (and even longer). In order to retain the temperature it says it will, for as long as it says it will, your thermos needs to be made of good materials. For the most part, this means stainless steel should be present in the construction materials. That’s where you’re going to get good temperature retention and a strong thermos that won’t break under a lot of use and abuse. You also want the thermos to be BPA free and food grade. These things should be clearly visible on any packaging so you know it’s safe to use. You may also want to look for a double-walled thermos, which is going to make it more durable but, even more importantly, add to the length of time it keeps your drink the right temperature (which is going to help with the point we already mentioned above). Okay, so this is a relatively minor factor in the long run, but it can be a nice feature and that’s why it’s important to mention. 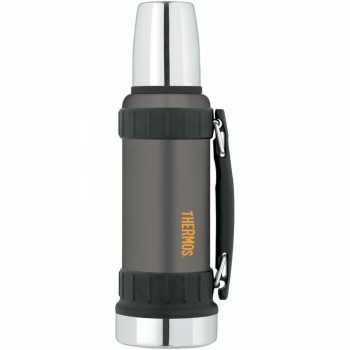 Some thermoses are small and only have a small spout, easy to drink through. Even some larger ones may still be easy enough to drink out of. When you get to the biggest ones, however, it’s often easier to have a cup that you can pour your beverage into. If you’re going to share with other people you want a cup to make drinking more sanitary as well. Some thermoses come with a cup as part of their lid. You’ll notice the lid that screws or snaps onto the top is actually quite large. This is because it doubles as the cup you get to drink out of. 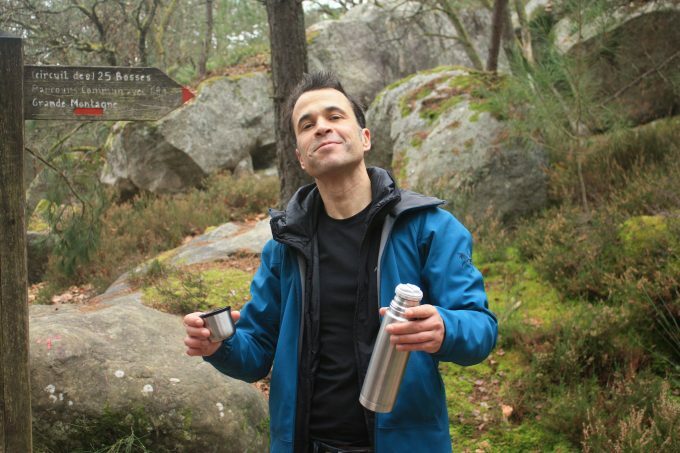 Even if you’re the only one who will be drinking out of the thermos, the sanitary factor remains and makes it less likely something will get into the thermos itself. 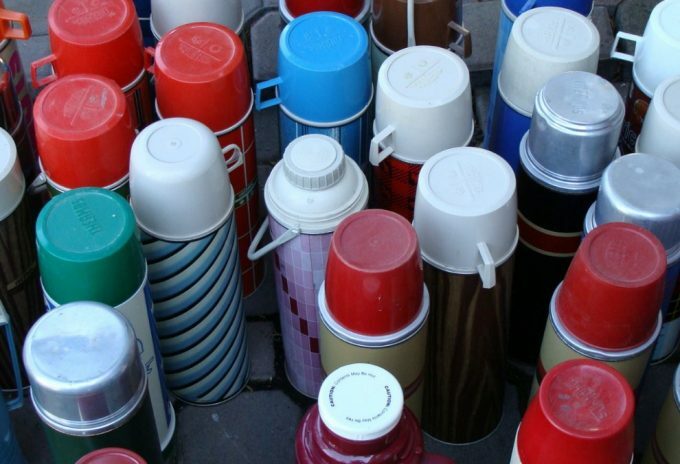 The size and shape of your thermos will dictate how easy it is to clean. If the opening at the top is small you may have a hard time getting the soap and cloth inside. If it’s larger, you’ll be able to get it clean easier and that means you’re more likely to use it frequently. You also want to look at the material that it’s made of on the inside and outside. This is going to affect how easy they clean and how much they may stain if you’re not careful. With stainless steel, you should be able to clean it quickly and easily. The same can be said about the outside of the thermos, which should be smooth and easy to wipe off when you may drop it in the dirt. 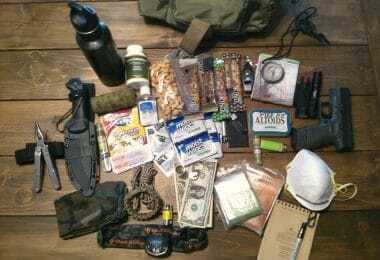 Look at what you can do to carry your thermos with you. If you can get one with a handle on it this makes it easier to take along. Most, however, don’t have anything to help you. That means you need to be able to hold it in your hand or put it in a pocket. Sometimes they are made with an ergonomic style so it’s easier to hold them. The most important thing is what you want to do for carrying it. If you don’t care how you’ll carry it then don’t worry. If you really want it to be held a certain way you also want to pay attention to that. You also want any handle to be made of quality material so you don’t have to worry about breaking it if you happen to drop your thermos. You know what matters now, so let’s dig in and see a list of the best choices in today’s market, ready to meet your needs and to keep your drinks as cold or hot as you want. Inexpensive in price, the Zojirushi Stainless Steel Mug is available in two different sizes, 12 ounces and 16 ounces. Not only do you get to choose the size that you want, you also get to choose the ideal color for you. There are five options and each one has stainless steel vacuum insulation. In fact, it’s made with 18/8 stainless steel on the inside so you can easily clean it and stop it from staining. The stainless steel is also food safe and the lid has a simple latch to pop it open and lock it closed. If you want to take ice along with you on the trail you can do it easily with the wide mouth of this bottle. It’s also designed to be tall and thin so it’s easy to slip into a side pocket on your bag while you’re drinking it or inside the bag when you’re not. Complete with a five year warranty, you’ll get a double-walled unit that keeps anything hot or cold for up to 6 hours. Users have found that it actually keeps them the right temperature even longer than this however, which is a bigger benefit for anyone who uses it. 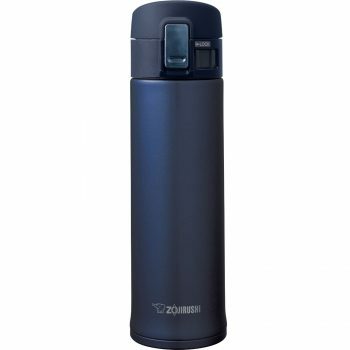 Related: Zojirushi also sells the SM-JTE46PX Travel Mug which has its own tea leaf filter if you’re more inclined to have tea than coffee or other hot beverages. Available in pink champagne, this mug is right around the same price and it’s the same size. 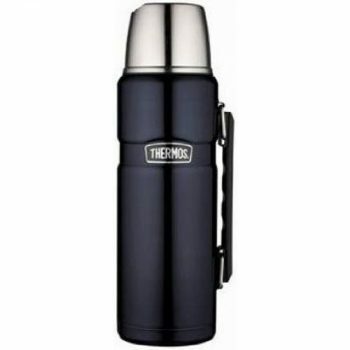 The Thermos The Rock Work Series is designed to give you a super easy to use bottle while you’re walking or hiking. It actually has a handle to make it easier to carry and is made with stainless steel on the inside and outside. That means you’ll be able to clean it easily by simply wiping it down and won’t have to worry about stains as you use it over and over again. The vacuum insulation is what helps you keep your drink the right temperature and it’s a patented formula Thermos uses on all of their products. Able to hold 1.1 quart of liquid, the cap screws off the top to create a stainless steel cup for you to drink from. Even better, this thermos has a wide enough opening that you can add ice cubes to help you keep your drink cold, as long as they’re a little on the smaller side. If you want something that will keep your drink the right temperature all day long, this is the one you want. It’s designed to keep drinks hot or cold for up to 24 hours so you don’t have to worry about extra ice or trying to heat it up anywhere else. You’ll be ready to go for as long as you want, and with plenty of your favorite beverage. Related: For anyone with a high quality thermos or mug, getting it cleaned properly can be the most important thing. That’s why you want to make sure you get a good quality cleaning brush like the OXO Good Grips Bottle Brush. Okay, so you’re not going to want to drink directly out of this one, but it’s a great choice if you’re going to stop for some breakfast or lunch along the way. 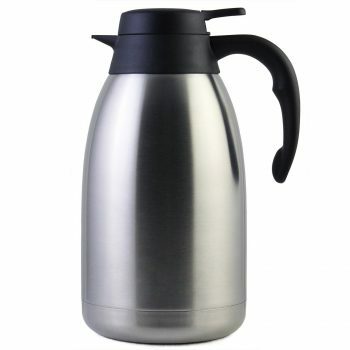 That’s because this Stainless Steel Thermal Carafe by Cresimo holds 68 ounces of your favorite beverage, so there’s more than enough for you and anyone you brought along for the ride. All you have to do is fill it up and the double walled, vacuum-sealed thermos will keep anything you want hot for up to 12 hours and cold for 24. Made with 18/8 stainless steel on the inside and outside, this carafe has a 1 year warranty that covers absolutely everything. It even has a super easy to use handle so you can pour out drinks into any glasses with just one hand to pour. If you want drinks to stay even colder you’ll be able to add ice cubes easily in the wide mouth. Because of the material it will also be cool even when your beverage is hot and it will avoid condensation at any time, even as your cold beverages start to warm. 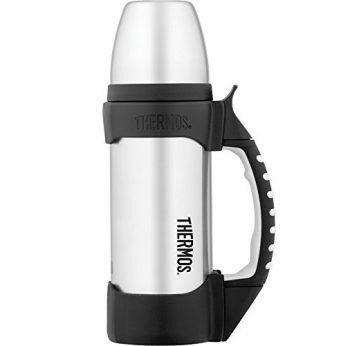 Related: Also by the same company that makes this thermos is the Airport Thermal Carafe, which gets you 101 ounces or 3 liters of containment. It keeps hot things for up to 12 hours and cold for up to 24 but in larger quantities. If you’re looking for a thermos that can get you through the day then you definitely want to look at the Thermos Work Series Bottle. If you’ve ever thought about buying a thermos this is probably what you thought of because it’s the iconic Thermos brand design. It features a handle on the sides that’s attached with hinges to help you hold it easier. It also has the patented double wall, vacuum seal technology. What’s even better is it can keep anything you want hot or cold for 24 hours straight, so you’ll always have a great beverage. It’s able to hold 40 ounces of whatever you want and has a large cup attached to the lid as well, so you can keep things a little more sanitary. If you want to add ice to your cold beverages you can do that as well because the container has a wide mouth to allow just that. It also is made with stainless steel on the inside and the outside so it’s easier to clean than others. At around $35, this is a great tool for the price tag and it’s built to stand up no matter where you are without the risk of slipping and sliding because of the rubber base. Related: The Thermos King Series is the same size but in a slightly different form. 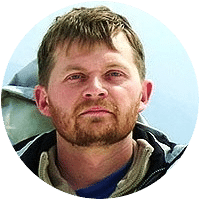 It’s able to keep things hot or cold for up to 24 hours as well and has a slightly different look while also saving you a little bit of money as it comes in about $10 less than this option. 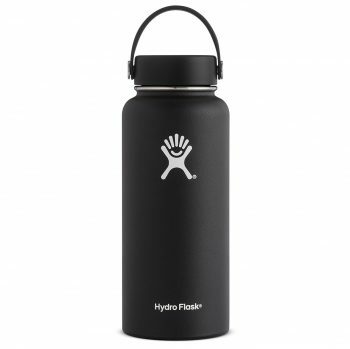 For those who want a simple water bottle that will help them carry their drink but without a whole lot of frills, the Hydro Flask Water Bottle is the thing for you. Available in a range of different colors (17 to be exact) and four different sizes, this water bottle is definitely enough for most, though it is a more basic option. It has a wide mouth so you can add your ice for cold beverages and is also able to hold a flip top and a straw lid depending on your preference. These are sold separately however, so you’ll have to buy them as well, unless you want to use the standard wide mouth opening. Made with 18/8 stainless steel and non-toxic, BPA-free plastic, this water bottle is still easy to clean like the others. The outside features a powder coating that is actually proprietary to the brand and makes it easier to hold onto because it provides a non-slip coating. For cold beverages you’ll get exactly what you’re looking for at 24 hours and with hot beverages it holds temperature for up to 6 hours. And even better, you won’t lose any of the great flavor to the bottle itself. Related: If you’re going to be taking this bottle into the wilderness or on long walks you’ll definitely want the Hydro Flask Wide Mouth Bottle which actually has a flip straw to make it a whole lot easier to drink out of but still lets you add water through the main opening. This water bottle may not look like anything special, but it’s definitely something you’ll want to give a shot on its own. 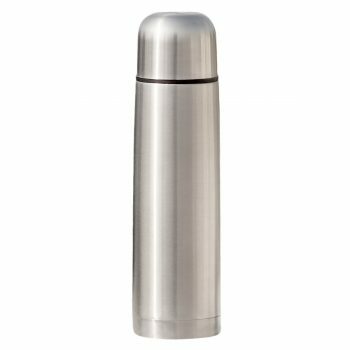 The Best Stainless Steel Thermos Bottle by Fijoo is stainless steel all the way around, on the inside and outside. In fact, that’s about all you see when you look at it. Still, you get a double wall, vacuum sealed thermos with an air tight lid and a cap that doubles as a cup to let you drink whenever you want. It also has a wider opening which makes it possible to add ice and it’s small enough around that you can put it in a car cup holder. Able to hold 17 ounces, this bottle is BPA free and keeps things cold for 24 hours or hot for 8. Strong and durable, even when dropped, this is a bottle that will make it just fine on your next hiking trip. It’s completely leak proof and sweat proof as well as being easy to clean. Because of the food grade stainless steel you also don’t need to worry about any metallic taste to your drink when you leave it in for an extended period of time. 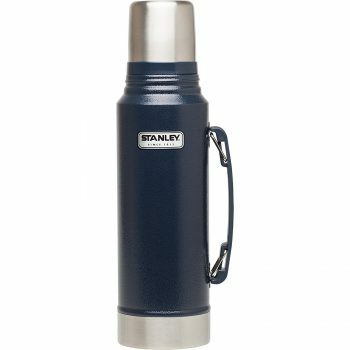 Another iconic name in the thermos industry is Stanley, which has been around for a very long time. With the Stanley Classic Vacuum Bottle you’re getting the newer version of the very bottle that they’re best known for. This one features the hinged handle to make carrying it easier and comes in two different colors. It’s also available in five different sizes including 1.1 quarts, 1.4 quarts, 2 quarts, 16 ounces and 25 ounces. That means you get the exact size that you need for your next trip. Able to keep drinks hot or cold for 24 hours, this bottle is actually able to keep a drink iced for up to 120 hours, which is definitely a feat in itself. Made with 18/8 stainless steel that’s naturally BPA-free, this bottle also has an insulated lid, vacuum insulated core and a leak proof seal. You can use the lid as its own cup and you can add ice to your drink easily with the wide mouth opening. With the lifetime warranty you can also trust that you’re getting something high quality, that you can trust. And with the steel outer shell you’re getting something durable as well. Related: For many people who purchase this water bottle a good food storage bottle can be a great tool as well. The Stanley Vacuum Insulated Food Jar, is available in 17 oz. or 24 oz. sizes and two different colors to keep your food the right temperature as well. The Thermos Stainless Steel King holds 40 ounces of your favorite beverage and comes in one of four different colors (which are entirely up to you). It has the patented vacuum insulated core to keep your beverage hot or cold for 24 hours and it’s stainless steel all the way through. The lid doubles as the cup you get to drink from, which makes it easier for you to drink or share on the go. Plus, because it holds plenty, you won’t have to worry about refilling constantly. The specialty spout on the lid makes sure you can pour without having to use the entire wide mouth opening to reduce spilling. The seal around the lid makes sure you don’t have any leaks when you store it away. Just the right size to easily carry with you in your hand or in your bag, this thermos is one that makes it a whole lot easier for you to head out with just the right amount of water, coffee, or anything else. It’s also cool to carry even when you store super-hot liquids inside, which is important for anyone who’s ever burned themselves on a hot coffee mug. Related: The Stanley Classic Vacuum Bottle is available in a slightly smaller size and at a slightly lower price as well. If you’re interested in this brand and the style of bottle you can find what you’re looking for with this one. If you choose any of these thermoses you’re not going to be sorry because each one has a whole lot to offer. 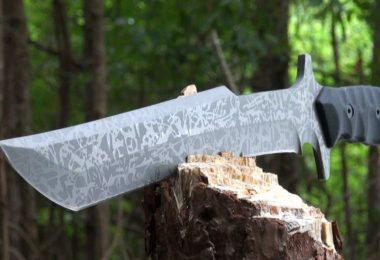 They’re all priced at a similar rate around $20 – $40, but you may find a couple outsiders. You’ll find that each of them is stainless steel (food grade, 18/8) and most have a cup included as part of the lid. What’s really great is they can all keep your drinks just the right temperature for at least a couple hours. If you’re looking for the most longevity however, you’re better off with one of our last two. Just make sure you give them all a chance. You might be surprised.